This post is written by Haroon Akram-Lodhi who is Professor in the Department of International Development Studies, Trent University, Ontario. 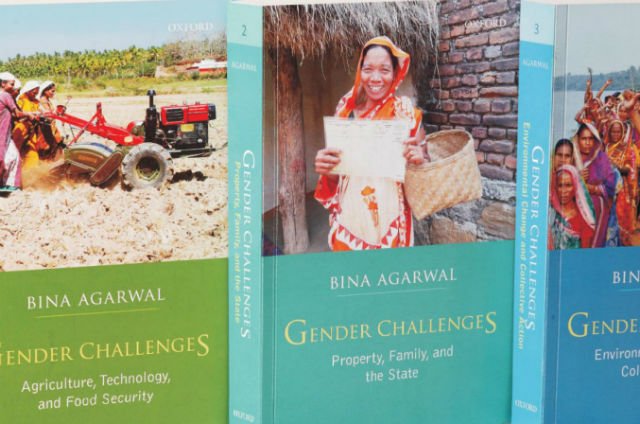 Gender Challenges, Volume 1: Agriculture, Technology, and Food Security, by Bina Agarwal. New Delhi: Oxford University Press, 2016. Pp. 400+xxiii. US$235 / Rs. 6595 (3-volume set, pb.). ISBN: 978-0-19-809982-6. Gender Challenges, Volume 2: Property, Family, and the State, by Bina Agarwal. New Delhi: Oxford University Press, 2016. Pp. 456+xix. US$235 / IRs. 6595 (3-volume set, pb). ISBN 978-0-19-809983-3. Gender Challenges, Volume 3: Environmental Change and Collective Action, by Bina Agarwal. New Delhi: Oxford University Press, 2016. Pp 426+xxi. US$235 / IRs. 6595 (3-volume set, pb). ISBN 978-0-19-809984-0. An activist scholar and former President of the International Association for Feminist Economics, Bina Agarwal is best known for her (1994) monumental A Field of One’s Own: Gender and Land Rights in South Asia, which a Pakistani feminist activist once described to me, appropriately enough, as “Das Kapital for women”. Agarwal has written 5 sole authored monographs, 5 edited volumes, and over 80 peer-reviewed papers. Her work is notable for the clarity of its argumentation, the originality of its analytical frameworks, and the rigour of its empirical observations, rooted in dedicated fieldwork and interdisciplinary quantitative and qualitative analysis. Many of her papers are in their own right landmarks in the study of gender, agrarian change, technology, property regimes and green governance. For this reason, the publication of the mammoth three-volume Gender Challenges is to be welcomed, for it brings together, in one location, a diverse and lucid selection of many of her best, and best-known works. While it may not do justice to the depth and breadth of the material, this review will identify the broad themes that underpin Gender Challenges, and Agarwal’s work more generally. The structure of Gender Challenges mirrors Agarwal’s intellectual development over the last four decades. Volume 1, Agriculture, Technology, and Food Security reflects Agarwal’s ongoing core concern in questions of agrarian production and productivity, food security, and technological change. It has three central themes that continue to be of critical importance in understanding processes of agrarian transition, and about which Agarwal continues to offer important, nuanced, analytically stringent and empirically-grounded insights. The first theme is the need to unpack the class and gender dynamics of technological change in farming as an inherently social and economic process. Understanding these dynamics requires disavowing the unsubstantiated assumptions that plague much of contemporary agricultural economics, and empirically investigating spatially-specific gendered labour allocations, cropping patterns and mechanization configurations on the basis of data that disaggregates farms into distinct classificatory groups, and which then looks for similarities and differences both within and between groups. Agarwal was a pioneer in arguing that it is only by undertaking an engendered agrarian political economy that the material implications of class and gender-based differentiation for agrarian productivity, agricultural growth and rural poverty can be uncovered and, possibly, addressed by policy. The second theme flows from the first: that gender-based differences are situated not only between households, but, crucially, within households and reflect “intra-family relations” predicated upon gender-differentiated “bargaining power” (p. 15) that impacts both historically and contemporarily upon production and productivity, access to food, health care, and coping strategies in times of household crisis. This theme, for which Agarwal is of course well known, leads into a third, which she has written about for years but, in my view, for which she is much less well known: the need to foster the emergence of “collectivities of the poor” that would be “small-sized, voluntary, socioeconomically homogenous, and participatory in decision-making” (p. 15) and which could produce, in appropriate circumstances, the social empowerment of the marginalized. The second and third of these themes play out in greater detail in the other two volumes of Gender Challenges. Volume 2, on Property, Family, and the State. which represents the middle-period of Agarwal’s career, strongly develops the second theme of intra-household social relations, reflecting the emergence of an intellectual focus for which she would (rightly) become famous. Again, for this reader three key themes emerge in the second volume, the first of which is the foundational requirement for agrarian political economists to analytically understand and empirically investigate intra-household bargaining and how such bargains shape how individuals participate beyond the household, in markets, communities and the state. Agarwal draws on Amartya Sen’s approach to cooperative conflict and entitlements, but goes beyond it by consistently emphasizing the material dimensions of power, most notably command over property (especially but not exclusively land), as well as the ways in which these material dimensions of power shape and are shaped by the social norms and cultural perceptions that structure command over property in a diversity of settings around the world. Gender-based differences in command over property, and the economic and social implications of such differences, are thus the second overarching theme of the second volume of Gender Challenges. The third theme is an examination of how material power and social norms can be embedded within the legal structures and regulatory assumptions that underpin gender inequalities in command over property and gender-blind public policy. Agarwal uses this framework to better understand processes of women’s resistance, and how this can drive legal changes that bring important and meaningful benefits to women. An aside is in order here. In the mid-2000s collaborative work with Pradeep Panda led to the establishment of quantitative relationships between gender-based violence and access to assets. It was found “that owning a house or land significantly reduces a women’s risk of marital violence”, while “employment makes little difference unless it is regular. Immovable property provides a woman economic and physical security, enhances her self-esteem, and visibly signals the strength of her fall-back position and tangible exit option” (p. 13). The third volume of Gender Challenges is subtitled Environmental Change and Collective Action. Covering the most recent period of Agarwal’s thinking, it has three overarching themes rooted in issues of collective action and green governance. The first theme is that women should not be treated as a homogenous, unified category of analysis, because of clear differentiation within and between categories of women. Thus, Agarwal’s gender analysis is intimately intertwined with a class analysis. The second theme is that, given the heterogeneity of women, environmental governance structures cannot take for granted the beneficial impact that they will have on women. Indeed, for environmental governance structures to benefit women a critical mass of women must effectively participate, so as to increase female bargaining power. The third theme of the volume is the important distinction between formal participation and effective participation. Where women are attending meetings, speaking up, and holding office” (p. 13), there is a positive impact on the operation of community forest institutions – institutions that can be important objects of gender-based collective action over livelihoods and the natural resources upon which livelihood strategies can be constructed. As this all-too-brief review makes clear, for feminist agrarian political economists the work contained in Gender Challenges is predicated upon two underlying empirically-grounded observations that remain central to the analytical frameworks and empirical investigations of agrarian political economy. The first is the need to frame questions on the basis of the heterogeneity of social groups, and that such heterogeneity, whether it be around the social divisions of gender and / or class, is rooted in differential access to and control over immovable assets, the impact of which is witnessed in differences in labour patterns and the control and use of incomes. It is from this that the need to strengthen women’s land rights emerges. The second is that challenging the social divisions of gender and class requires addressing differential access to and control over immovable assets, and that this can only come about as a result of collective action that builds institutions that are responsive to cross-class communities of the dispossessed, rather than sections of communities. These two observations are predicated upon a methodological understanding that is absolutely central to Agarwal’s work: the requirement that investigation should not proceed on the basis of assumptions but should rather proceed on the basis of understanding the realities in which people live in their households, their communities and their societies. In particular, analyses that proceed by treating households as homogenous and unified institutions that share assets, labour, incomes and expenditures must be discarded in favour of approaches that recognize households as sites of cooperation, negotiation and conflict, and social division as endemic within and across communities. Gender Challenges is far more than a collection of forty years of pioneering work. It exceeds the sum of its parts, as Bina Agarwal continues to insistently set the agenda for engaged feminist agrarian political economy. This collection will be welcomed by all serious students, scholars and activists engaged in the facilitation of progressive, pro-poor agrarian change.